History of the Vagrond Character – Giant Space Lizard! This page gives a short history of the Vagrond character. 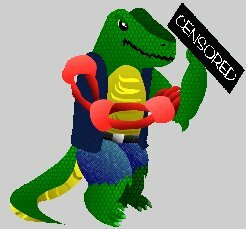 I have uploaded some old RPs featuring Vagrond from the USS Knight and the IWO/WWR/other e-wresting sims here (please note that they are much less suitable for children than the rest of Giant Space Lizard). Chad Wagner once suggested that I created the name “Vagrond” by combining the words “Vagabond” and “Vagrant”. I wish I had done something that intelligent to capture the spirit of the character. The truth is that I just mashed keys on the keyboard and got VGRND, and added some vowels. Vagrond was first created for the USS Knight Star Trek e-mail sim. The above image was drawn with colored pencils around 1997. In this sim Vagrond was a Gorn, as he had to live in the Star Trek universe. He started at first as an old Gorn general who acted serious and gruff. This didn’t last long. I eventually retconned him so that his age of 130-something made him more like a teenager in Gorn years. When I introduced the concept of Gorn alcohol, a noxious brew instantly fatal to normal humanoids but the minimum strength necessary to give these giant lizards a buzz, it was all over. Vagrond was no longer a “canonical” Gorn, having cat-like reflexes and a tail he used to strike his opponents, so I quit the USS Knight. In 1998, when I told Chad Wagner (Chaerb) about Vagrond, Chad made Vagrond the bodyguard/pet of his new character Rob Kestler in the IWO e-wrestling federation. Once again it started out fairly seriously and as something that made sense in the world in which the sim took place. Here Vagrond was originally an escaped mental patient in a “Gorn costume” who acted as Kestler’s bodyguard. However this was quickly dropped and soon Vagrond was Kestler’s giant space lizard pet of indeterminate origin. Vagrond in Kestler RPs generally spent his days in a drunken stupor, awakening only when Kestler was threatened to dole out copious amounts of violence. The exception to this was, of course, when he appeared in the series of classic 1970s films, “Vagrond and Doobie’s Psychedelic Adventures”, co-starring with Julius “Dr. J.” Irving who only spoke in rhyme. Vagrond is no longer a Gorn, nor is he a man in a costume anymore. He is, and will remain, a giant space lizard. In 2007 I registered the domain GiantSpaceLizard.com, however it would be one year before any comics actually posted. Until then visitors were greeted with the above image of Vagrond flipping them off. For the uncensored version of this image, click here. Today Vagrond is the protagonist in a Space Adventures comic and reprising his role in a Rob Kestler comic.